A historically incorrect but contemporaneously common method of referring to the indigenous peoples of the Americas. Believing, or hoping, that they had stumbled upon the eastern shores of the subcontinent of India, fifteenth- and sixteenth-century European explorers called the local peoples they encountered "indios" (in Spanish) or Indians; the misnomer stuck and is a vernacular conundrum that persists in the Americas through to the present. Contemporary references to indigenous peoples in the Americas have replaced "Indian" with tribal names, or the terms "Native American" or "First Peoples." Hillerman's fiction deals exclusively with Native American cultures located in the Southwest region of the U.S., in particular the Navajo, but also the Hopi, Zuni, and other Pueblo groups. In most cases, Hillerman uses the word Indian when referring to members of these various cultures. 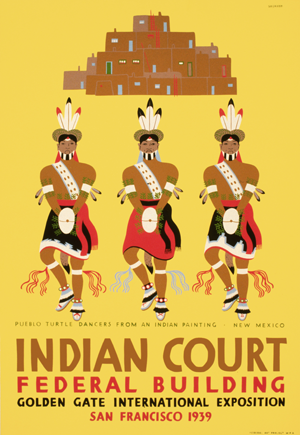 "Pueblo turtle dancers, New Mexico, WPA poster for Golden Gate International Exposition, San Francisoi, CA, 1939" by trialsanderrors.